used gear : we buy used gear! contact us for pricing. often we receive cosmetically clean and functionally perfect second-hand equipment for consignment purposes or in trade deals. please email or call for further information on any of these items, or let us know if you would like to trade your used equipment towards new gear. feel free to ask for our consignment terms. dark energy ii is a monophonic stand-alone synthesizer with usb and midi interface. the sound generation and all modulation sources are 100% analog, only the usb/midi interface contains digital components. dark energy is built into a rugged black metal case with wooden side plates. high quality potentiometers with metal shafts are used and each potentiometer - except the filter mode control - is fixed to the case (no wobbly shafts and knobs). the distance between the controls is a bit wider compared to a-100 modules and knobs with vintage look are used. unit is in good working condition. for more info, please click here. the sleepdrone 6 is a hex oscillator analog drone machine. the sleepdrone 6 creates aggressive fighter bomber drones, smothering all matter within audible range into a brutality harmonic meditation. unit is in good working condition. for more info, please click here. drummer from another mother (dfam) is a highly-interactive, semi-modular analog percussion synthesizer and a vibrant deviation from the traditional drum machine. handcrafted in asheville, nc by the employee-owners at the moog factory, dfam is the first addition to the mother-32 family of synthesizers and presents an expressive hands-on approach to percussive pattern creation. it requires no patching, and absolutely no experience is needed for human-beings of any age to quickly begin synthesizing new and unique rhythmic compositions. synthesizer is in good used condition & perfect working order. for more info please click here. the bass station ii is an analogue mono-synth based on the classic original bass station but re-worked for the 21st century. it has two filters, two oscillators plus a third sub-oscillator, patch save and a fully analogue effects section. add a step sequencer, arpeggiator, full sized keys and a powerful modulation section and you have the makings of a synth that is built for bass, but capable of so much more. synthesizer is in good used condition & perfect working order. for more info please click here. the heart of the kick lancet's sound structure is an analogue oscillator that produces sine- and square waves, which can be blend seamless from one to the other. two independent envelope generators with a decay/release phase can modulate the oscillator's frequency and the vca. additionally the vco pitch can be modulated by the fast lfo (3hz to 3khz, triangle). noise and a pulse signal can be added in the mixer section. and we have a balls controller for making it really big. synthesizer is in good used condition & perfect working order. for more info please click here. the prophet 12 is the most cutting edge hybrid synthesizer on the market and defines what a modern polyphonic synthesizer is. designed and manufactured in san francisco, the prophet 12 module has a glorious combination of form and function in a sturdy, portable and elegant build. use it as a desktop module or add it to your rack with the optional rack mount kit (available separately). unit is in good working condition. for more info please click here. the tenori-on is an electronic musical instrument designed and created by the japanese artist toshio iwai and yu nishibori of the music and human interface group at the yamaha center for advanced sound technology. it consists of a hand-held screen in which a sixteen-by-sixteen grid of led switches are held within a magnesium plastic frame. any of these switches may be activated in a number of different ways to create sounds. two built-in speakers are located on the top of the frame, as well as a dial and buttons that control the type of sound and beats per minute produced. unit is in good used condition & perfect working order. for more info please click here. note that the unit is in the original box with the original power supply. beatstep pro is unlike anything you have ever used on stage or in the studio. wherever you are, whatever gear is available, taking control of the creative process has never been so easy. the unit is in good physical condition and works perfectly. for more info please click here. each of the 6 analog voices has 2 analog oscillators plus 2 digital oscillators (with a large bank of included samples), dave's classic analog low-pass filter with audio-rate modulation, an additional high-pass filter, analog vca with feedback, 5 envelopes, 2 lfos, an extraordinary variety of analog modulation routings, and stunning sonic quality, warmth and punch. although optimized for drum sounds, it excels at tuned sounds as well, and even doubles as a 6-voice analog synth. in addition to the 6 direct voice outputs, there are stereo mix outputs and phones outputs, plus 2 inputs for foot switches or expression pedals, midi in/out and usb. unit is in good working condition. for more info please click here. with outstanding sounds, powerful sequencing and pattern management, and awesome korg effects, the korg electribe is primed for modern music production. much more than a typical drum machine, you can construct 16-part arrangements, synchronize with other korg instruments, and even export your productions as an ableton live set! over 400 sounds are on tap, assignable to the 16 velocity-sensitive pads in any combination you like. when it comes to creating drums, bass, and synthesizer grooves for your studio projects or live performance, you'll be blown away by the korg electribe music production workstation. unit is in good used condition & perfect working order. for more info please click here. please note that the unit is in the original box with all original packaging, power & manual. spanning the gambit of known delay possibilities and beyond, the echosystem could be the ultimate delay-crafting tool. faithful emulations of classics like digital, tape and analog delays are numerous, as well as empress' own take on each of these delay styles. moving beyond the traditional, the vast amount of sonic ground the echosystem can cover becomes apparent. check out the ambient modes when you're feeling chilled out, or perhaps a visit to the multi tap modes for a taste of inspiration. unit is in good working condition. click here for more info. the empress superdelay isn't your basic delay. sure it does basic delay sounds, and it sounds better than anything else out there while doing them. but if all you want is a simple delay, the empress superdelay isn't for you. the empress superdelay is for musicians who want to be inspired by their pedals, not limited by them. pedal is in good used condition & 100% working order; power supply included. click here for more info. packed with knobs that let you control everything from tight, radically fuzzy sounds that gate off instantly when you stop playing, to intermodulating oscillations that fight for control of your guitar as your notes decay, to shortwave radio sounds, ripping velcro and octave-like fuzz. now includes an on/off led and dc power jack! pedal is in good used condition & perfect working order. click here for more info. this is the original tremolo/wah pedal from zvex, complete with sequencer and random mode. eight wah settings for the sequencer with either 4, 6, or 8 steps give you a variety of sounds, and you can change up your speed with the ooh wah's tiny speed knob. pedal is in good used condition & perfect working order. the adsr is a four stage linear envelope with two expressive ranges. each stage can be modified independently allowing for the creation of complex, multi-segment envelopes. great for modulating filters, vcas, and oscillators. the module is in good physical condition and works perfectly. for more info please click here. the eurorack atoner is a versatile device used for distorting/bit crunching audio, generating poly-rhythmic cv clocks, extracting lower harmonics from audio and pitch shifting/jumping (downwards). the module is in good physical condition and works perfectly. for more info please click here. the pingable envelope generator (peg) from 4ms is a dual envelope generator whose envelope lengths are set by incoming clocks or "pings". the peg has full cv control of envelope shape, skew, and ping (clock) division/multiplication, as well as a plethora of triggering and cycling options (ad, ar, quantization, cycle), and a tap tempo button for each channel. module is in good shape & works perfectly. for more info please click here. multiply-by-1 to multiply-by-64, on 8 output jacks. five slipped/shuffled/skipped clock outputs (s3, s4, s5, s6, s8). each is based on a multiple of the input clock frequency (x3, x4, x5, x6, and x8, respectively). three steady clock outputs (x1, x2, and x8), which are not effected by slip/shuffle/skip effects. module is in good working condition. for more info please click here. multiply-by-1 to multiply-by-64, on 8 output jacks. five slipped/shuffled/skipped clock outputs (s3, s4, s5, s6, s8). each is based on a multiple of the input clock frequency (x3, x4, x5, x6, and x8, respectively). three steady clock outputs (x1, x2, and x8), which are not effected by slip/shuffle/skip effects. modules are in good working condition. for more info please click here and here. warm, classic sound combined with a modern feature set, built into a low-profile, high-quality 10hp eurorack module. simultaneous, ac-coupled low, high, band and all-pass outputs. wide-ranging frequency cutoff and resonance to self-oscillation. feedback insert for 'stacked' filter types and wild sonic manipulation. full cv control, on-board attenuation and dedicated 1v oct input. dedicated attenuation and gain of both audio and feedback inputs. lush pads, tearing leads, deep filter kicks, sound design and more. the ade-20 brings classic character to the modern modular. module is in good working condition. for more info please click here. the addac111 ultra .wav player is the long waited upgrade to our praised addac101 .wav player. while keeping all functions of the original, there's more dedicated controls as well as a few new functions. for this version we chose to use micro sd cards, this decision was made in order to help the hardware construction and make it only 3cm deep. an expansion module, addac111b, was also created to allow users to recall the first 8 files through dedicated trigger signals. this allows sequencing of files. modules are in good working condition. for more info please click here. the aion modular 904b high pass filter is an eurorack clone of the classic moog modular high pass filter. the 904b high pass filter attenuates frequencies below the fixed control voltage (cutoff frequency) point at a rate of 24db per octave. the cutoff frequency is voltage controlled through the three control inputs at the bottom of the module (1v per octave). the fixed controlled voltage knob adjustes frequency over 12 octaves span (1v per octave). module is in good shape & works perfectly. for more info please click here. two completely independant vintage sem style filters, with a central mixing bus for both audio and frequency control voltages which allow the two vcf's to be combined in both serial and parallel modes, and vcf1 can be inverted against vcf2. so the two vcf's can be combined to behave as a 24db sem filter, vocal formant filter and much more! module is in good condition & 100% working order. for more info click here. the minimod dh-adsr envelope generator is a compact 10hp wide eurorack format module. it has been developed to offer a full adsr envelope for the minimod system and of course other eurorack synthesisers, as an alternative to the original model d style contour generators which do not have separate decay and release controls. the dh-adsr uses exactly the same discrete transistor circuitry as the original model d contour generators, so it retains all of the "punchiness" of the original, along with it's unique multiple key trigger behaviour; we have simply added a release control so that it now offers a true adsr envelope, and the decay and release curves can be individually controlled. module is in good condition & 100% working order. for more info click here. the minimod glide uses a discrete dual fet circuit which includes a hold function that can gate the glide effect. glide is only active when the hold cv input is high, so if the hold input is connected to the gate output of a midi/cv convertor then the glide will be active only while the key is actually depressed, emulating the exact behaviour of the original model d synthesiser. module is in good condition & 100% working order. for more info click here. pe-1 is a dual band parametric eq and simple two channel mixer. two control sections provide a sweepable cut or boost to a selectable upper and lower frequency band. the module has two ac-coupled audio inputs, one of which has an attenuation control for basic mixing, and a single audio output. module is in good working condition. for more info click here. t-wrex has two separate sections: stomp is a bitcrusher and chomp is a decimator. you can sweep each effect from imperceptible all the way to rumbly, growling sonic debris. use each section's voltage-controllable dry/wet circuit to find the perfect balance of harmony and havoc! module is in good working condition. for more info click here. the sub ring is the missing 5-channel analog mixer section of your modular, especially tuned to play well with oscillators. it features a ring mod, 2 sub octaves, and a noise generator. it adds character, volume, and depth to your synth voice. all 5 channels are summed at the 'mix' output and have 1.5x amplification. a mix out and dedicated white noise output are provided. use the sub ring to fatten and add depth to your patches! module is in good working condition. for more info click here. sometimes, a company has to throw down the gauntlet and say "this right here is the best thing, period, full stop." sequencer 1 is that thing. it is, empirically, the most sophisticated euro-rack sequencer available. with a musically intuitive approach to programming, a massive helping of generative functions, and a feature list as long as, well, a really, really long list, sequencer 1 covers all the bases, and then some. module is in good working condition. for more info click here. what do you get when you take a shift register noise generator and the six-square-wave oscillator stack from the tr606 cymbal source and put 'em in one unit? mad hatter! module is in good condition & 100% working order. for more info click here. the left side of the unit comprises a triangle core oscillator, a vca, two envelopes, and a waveshaper, and the right side is a noise source, multi-mode resonant filter, vca, and one envelope. with a logical layout and versatile voice topology, boomtschak is capable of face-melting kick drums and snares, and more strange percussion and sound fx than you can shake a (drum) stick at. the oscillator bottoms out at 5 hz (!!! ), and can track 1v/oct over nearly seven octaves, so you can also use boomtschak as a synth voice, for paint-peeling sub bass or a mallet-style melodic source higher up. the module is in good physical condition and works perfectly. for more info click here. shapes is a combo platter of effects. we started with 16 smoothly interpolated wavetables that can be scanned from audio input. then we added nine waveshaping algorithms, and made it true stereo for good measure. module is in good condition & 100% working order. for more info click here. in the context of modular synthesizers, the monster k-fuzz is a sound modification device that functions as a cross between a vcf and a wave shaper. the upper octave fuzz circuitry creates distinct overtones that traditional filters are not capable of. and even when fully overdriven, the monster k-fuzz sounds organic and warm - just what you'd expect from a great vintage fuzz - but designed specifically for modular synth. module is in good working condition. for more info click here. a digital-based arpeggio that will sequence vco's (for example) with looping arpeggio patterns. the classic up, down, alternating, etc. can be done with this module. this replaces vc arpeggiator v2. the following have been added: more outputs, a reset button and a lag circuit on one of the outputs. module is in good condition & 100% working order. for more info click here. circuits found on the tadpole sequencer: a 16 step cmos-based sequencer, an internal cv variable pulse clock, a cmos-based logic inverter, and a cmos-based clock divider circuit. module is in good condition & 100% working order. for more info click here. so what does the tpc vco do? it is considered a synthesizer 'singer' or voice. this module generates audio signals, and at slow frequency can control other modules (lfo mode). blue lantern also included an analog sample and hold circuit, internally clocked by the core vco. the module is complimentary to the lunar moduation center vco. both contain the same discrete, transitor core triangle generator. module is in good condition & 100% working order. for more info click here. 2 pole state variable filter. 12db high pass, low pass and notch filter. 6db band pass. self oscillation in all modes. 2 cv frequency inputs with attenuators. notch filter balance sweeps between high and low pass. module is in good condition & 100% working order. for more info click here. the top section of the dual-function 285e performs frequency shifting; up and down outputs are simultaneously available. the reference frequency can be externally applied or internally generated; the latter can be voltage-controlled and modulated using fm. the bottom section is independent, and functions as a balanced modulator of the applied signals. the degree of modulation is voltage-controlled, and the reference frequency can be internally generated or externally applied, as with the frequency shifter. a separate audio output is dedicated to classic ring modulation, a subset of balanced modulation. module is in good working condition. for more info please click here. the xr22 vco ft is a modified version of the previous model xr22 vco with a different manual frequency control. instead of the two &pm;2-octave switches and the two frequency knobs (ca 4-octave range), there are now two frequency knobs (ca 7-octave range) for coarse tuning and 2 fine tuning knobs. further, the 'low f' frequency range switch - which works for both fsk frequencies - is replaced by a 3-position shift switch with the settings 'lo' (for lfo/ tremolo applications), 'mid' (for bass sounds) and 'hi' (for normal/high frequency sounds). module is in good condition & perfect working order. for more info please click here. the intellijel / cylonix collaboration cyclebox ii is a complex digital duo vco plus a suboscillator capable of operating a variety of modes. multiple wavetable-based waveforms are on tap for both oscillators in addition to vc controllable wavefolding, through-zero fm of oscillator 1 by oscillator 2, and internal or external sync. module is in good condition & perfect working order. for more info please click here. the trigger man is a unique trigger/gate sequencer module with a revolutionary interface that enables you to create any sequence with just two knobs. module is in good working condition. for more info please click here. the filtare seiii is a multimode, state-variable voltage-controlled filter that gives you low-pass, band-pass and high-pass outputs which are all simultaneously available. it also includes a notch output which allows you to change the balance between low-pass and high-pass. the seiii uses discrete components but is based on ssm2040 architechture, giving you a very musical sounding filter. there are cv inputs for frequency, resonance and notch balance. the 1 v/o cv input for frequency can be used to have the filter follow what you're playing on the keyboard or just crank up the resonance and use it as a sine-wave oscillator. module is in good working condition. for more info please click here. module a-107 is a completely new voltage controlled filter that has available 36 filter types: different versions of low pass, high pass, band pass, notch, all pass and filters with new response curves that have no name up to now. the frequency response curves of the 36 filters available in the a-107 are shown in the graphics at the end of this page. the filters are organized in two groups of 18 filters each. the transition between different filter types within one group can be soft (morphing) or hard (switching). module is in good used condition & perfect working order. for more info please click here. module a-110 is a voltage-controlled oscillator. this vco's frequency range is about eight octaves. it can produce four waveforms simultaneously: square, sawtooth, triangle, and sine wave. the frequency or pitch of the vco is determined by the position of the octave (range) switch and tuning (tune) knob, and by the voltage present at the cv inputs. frequency modulation (fm) of the vco is therefore a possibility. footage (the octave of the fundamental) is set by the range control, and fine tuning controlled by the tune knob. the module is in good physical condition and works perfectly. for more info please click here. module a-111-1 (vco 2) is a voltage controlled oscillator. the vco has a range of about 12 octaves, and produces four waveforms simultaneously: pulse (rectangle), sawtooth, triangle and sine waves. the vco's frequency is determined by the position of the range switch, tune and fine tune controls, and the voltage at the two pitch cv inputs, cv 1 and cv 2. footage (the octave of the fundamental) is set by the range control, which has seven octave steps. the tune control is used for coarse tuning, and the fine control for fine tuning of the vco pitch. the a-111 can be modulated by both exponential and linear fm (frequency modulation). you can control the pulse width of the square wave either by hand, or by voltage control - pulse width modulation, or pwm for short. module is in good used condition & perfect working order. for more info please click here. module a-124 is a special 12db multimode filter using the "strange" filter circuit of the "edp wasp" (an analog synthesizer with black/yellow case built end of the seventies, manufactured by the uk company "electronic dream plant"). this design "abuses" digital inverters as analog operational amplifiers leading to distortions and other "dirty" effects that generate the specific sound of this filter. the filter is equipped with a band pass output and a combined low/notch/high pass output. for this output a control knob defines the relation between low and high pass signal. if both signals appear at the same level (i.e. middle position of the mix knob) one obtains a notch filter. otherwise the low or high pass signal predominates. the filter enables no self oscillation in contrast to all other vcfs of the a-100 system. the module is in good physical condition and works perfectly. for more info click here. the a-137 is a voltage controlled wave multiplier. the basic idea of a wave multiplier is to multiply the waveform of an incoming signal (e.g. triangle/saw/sine from a vco) within one period of the waveform. this leads to additional harmonics of the incoming signal. the period and consequently the pitch of the signals remains unchanged (in contrast to frequency multiplication e.g. with the pll module a-196. the a-137 works as a kind of "inverse low pass filter", i.e. it adds a lot of harmonics to a signal that contains none or only a few harmonics (e.g. sine or triangle waveform). in contrast to that a low pass filter (e.g. a-120) removes harmonics from a signal that contains a lot of harmonics (e.g. saw or rectangle waveform). consequently the best results are obtained in combination with input signals poor in harmonics (e.g. sine or triangle). the a-137 can be used with signals rich in harmonics too (e.g. saw) but the effect is not as remarkable as for triangle or sine waves. for rectangle signals none or only little effects are obtained. the module is in good physical condition and works perfectly. for more info click here. this module tops the erica black series with mind blowing sound effects that are designed in a close co-operation of erica synths team rider kodek and spin cad software creator gary worsham. furthermore, external effect boards (sold seperately) containing sets of effects can adapt erica black hole dsp to your way of creating music. use the module with erica black cv expander for more delicate cv control over parameters. module is in good working condition. for more info please click here. the erica synths black voltage controlled amplifier is a uniquely designed hi-fi vca. black vca has improved attenuation levels, excellent cv reject in audio circuit and cv bias control for great tremolo effects. moreover smooth fading between linear and logarithnic response modes has been implemented. module is in good working condition. for more info please click here. the beating heart of your modular system. the module generates several clock signals simultaneously and it has advanced features (tap tempo, shuffle, divide) both for controlled, rhythmic music production and for experiments with high level of uncertainty. module is in good working condition. for more info please click here. module is distinct multifunctional analogue effects module that combines bbd chip based effects with an adjustable tube overdrive in the delay output and feedback path for extra thickness of sound. module is in good condition & perfect working order. for more info please click here. erica pico dual vca is simple, reliable lm13700 based linear voltage controlled amplifier, which can be configured as two independent vcas or stereo vca with same cv control. module is in good working condition. for more info please click here. the disting is a many-in-1 multifunction module, offering a variety of cv and audio processes, including a selection of oscillators (lfos/vcos). all algorithms have two high-precision inputs and outputs, and a third control input, exposed on a front panel knob and a cv input. module is in good used condition & perfect working order. for more info please click here. first, this is a basic joystick. it is not a precision device. of course, if you are looking for a precision control interface, a joystick should be the last option on your list - if at all. a regular control potentiometer has 310° of rotation, while the standard joystick has only a 60° arc of travel to cover the same amount of resistance, that's 1/5th of the resolution! but we can do better than that: choices uses a joystick assembly that has 90° arc of travel, and is the smoothest-feeling joystick i have ever found. the module is in good physical condition and works perfectly. for more info please click here. this is basically an 8-step sequencer providing a trigger out, gate out, and an cv out with attenuation. there is also a clock input, a reset input, a manual reset switch, and a manual step switch to control the sequencer. for each step there is a cv control. very handy, but nothing special so far. but hey, there is a 3 position switch for each step to control the gate/trigger ouputs. why 3 positions? on, off, and...errr... adc. adc? adc! this means that each steps gate can be controlled manually (on/off) or by the adc (analog2digital converter). the adc converts an analog voltage into an binary 8-bit pattern, i.e. iiooioio. this pattern is applied to the 8 steps of the sequencer, however, the manual switch overwrites this pattern (i.e. 1st step set to on, all other steps to adc). the result: you can select all 256 possible patterns either manually or by an external voltage. module is in good used condition & perfect working order. for more info please click here. the mh31 vc modulator is a ring modulator of a different caste. contrary to other common circuits, the mixing of frequencies is realized by using operational amplifiers. the result differs audibly from other ring modulators and one must not expect the classical functions of a standard ring mod. here we come into noisy and dirty terrain. moreover, the module is dc-coupled, so it is usable for control voltages too. module is in good working condition. for more info please click here. meth amp is based around the fuzz core of the eh big muff pedal. lovely fuzz and distortion based on the classic big muff pedal! It'll do wooly warm fuzz, subtle tone shaping with a soft saturation/colour, feedback madness and work as a great output vca (lpg style tones possibly too). the clipping diodes have been replaced by red leds to take account of the change in power supply from 9v in the original big muff to +/-12v in meth amp. to the fuzz core has been added a bunch of otas, each controlling a different aspect of audio processing: gain, regen (a new feature, not present in big muff), tone and volume. thereby, each feature is fully voltage controllable. additionally, there is a separate x100 preamp which can be used to boost external audio for further processing by meth amp. module is in good used condition & perfect working order. for more info please click here. algorhythm is an 8-step pulse sequencer. modules can be linked to create longer patterns. illuminated switches provide control over looped and one-shot playback, sequential and random modes, and gate/trig output for the pattern. loop length, pattern length, and gate/trig status can be modified in realtime. all settings are automatically saved in memory and restored at startup. module is in good used condition & perfect working order. for more info please click here. binary is a 1-bit analog computer that takes up to six inputs and determines whether the output should be high or low. it is intended to combine gates/triggers from algorhythm modules, but works with most other cv and audio sources within a modular system. each input includes an on/off switch that illuminates when a pulse is received. the output can be switched from or to nor logic for different applications. module is in good used condition & perfect working order. for more info please click here. mmm vcmmm vcff (m**g multi mode voltage controlled filter) is a dual vcf having common controls for both parts. thus it can be used as a stereo filter, or patched with different combinations of the available inputs/outputs. and all this functionality is packed in the compact 8 hp wide module. mmm vcf has the famous transistor ladder core introduced by bob moog, but also features the added band pass and low pass modes, not available in the original design. those extra modes are greatly widen the possible spectral modification of the input sound. the module was carefully designed to have vanishingly small noise and bleed. the module is in good physical condition and works perfectly. for more info, please click here. galilean moons is a dual amplitude transmutator. it transmutates the amplitude of incoming signals through the use of voltage controlled envelopes and vcas. it is designed primarily to create voltage controlled percussive sounds when fed with a sound source (in particular, its sister module, jupiter storm), but can be used for all sorts of other tasks in your modular system as well as to generate typical synth sounds. module is in good condition & perfect working order. for more info, please click here. jupiter storm is a cosmic noise oscillator. it creates sounds that can only be described as out of this world! where it differs entirely from other pure noise generators (such as vcnoiz) is in the algorithm used to produce the sound. jupiter storm has a tonal character very much of its own. module is in good used condition & perfect working order. for more info please click here. the mutant hot glue is a powerful bus mixer for analog effects chain design. the included high quality analog compressor offers series or parallel compression, and a sidechain input, making it well suited for drum processing. the voltage controlled distortion is based on the batteryacid: idow edition design, but improved for better signal fidelity and performance. it can be used in its default position, normalized to the effects send, or like every other part of the module, broken out and used elsewhere in your modular system.ed inject alters the bias point creating an even wider palette of sounds. module is in good working condition. for more info please click here. the mutant machine is a dynamic analog instrument capable of generating a wide palette of sounds, ranging from various forms of analog percussion to complex drones and oscillations. to achieve this, the machine features two synthesis sections which are summed together at the final output: membrane and snappy. like the other mutant drums, the membrane and snappy circuits began their mutation as classic analog percussion techniques and have been reimagined for 21st century modular synthesis. module is in good used condition & perfect working order. for more info please click here. analog pattern generation/sequencer arrangement + combining up to 8 steps of sequences long (with 4 sequencers as sources). module is in good used condition & perfect working order. for more info please click here. a compact switched routing matrix for both audio and dc-coupled control voltages, switchmix has all the advantages of pin matrices without the problems. module is in good used condition & perfect working order. for more info please click here. 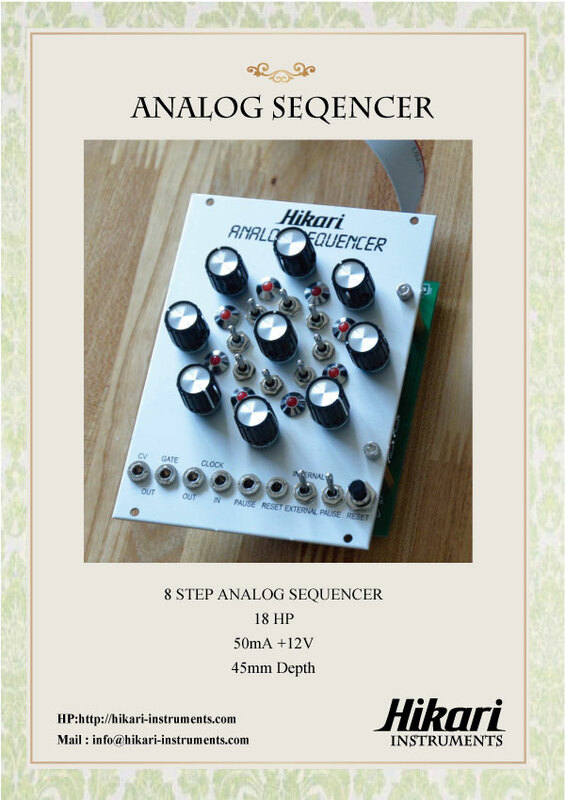 8 step analog sequencer. module is in good working condition. for more info click here. single row eurorack module space (3u) with additional 1u row along the top for mounting all sorts of essential utility modules. super strong extruded aluminum design. highly resilient surface finish that has been anodized and sandblasted. threaded inserts allow for modules to be mounted with standard m3 screws, no sliding nuts! the μmidi 1u provides all the essentials to control and sync your eurorack modular from your computer, iphone/ipad, or hardware midi device with a minimum of fuss. no menu diving or configuration scripts, just two buttons. the connectivity, feature set, and compact size make the μmidi 1u ideal for integrating your modular with the rest of your rig while not taking up too much space in your case. the case/module is in good physical condition and works perfectly. for more info click here, here and here. manual gate buttons. three timing ranges: (1 second, 10second, 1minute a/d times). normal and inverted outputs. end of decay (eod) logic output. cycle mode (which gate logic control). retrig input (allows re-triggering of the envelope if source gate held high). dynamic control of the envelope output level (each adsr is routed through a linear vca and the control is normalled to +5v via the level jack. you can patch another control source like an lfo or velocity level from a keyboard to this jack. the module is in good physical condition and works perfectly. for more info click here. analog coloring compressor module. module is in good condition & 100% working order. for more info click here. the original circuit was designed by analog guru david g. dixon after carefully studying and analyzing the classic korg ms-20 filter. his work resulted in a completely original circuit based around ssm2164 vca chips. this design is capable of almost identical results but is far more versatile. this is not a clone, it is an entirely new and modern circuit with many enhancements. module is in good condition & 100% working order. for more info click here. david dixon discovered some ways to derive even more fun and versatility out of the original circuit. the korgasmatron ii now features a completely independent six mode filter on each side! the modes are selected via a 6 position rotary switch. we have also added a special overdrive feature so that the output signal can be soft or hard clipped depending on how hard you drive it into the circuit. this is controlled via the input amp which starts clipping when you put the knob past 12 o'clock (assuming an standard 10vpp input waveform). there are switches to select hard or soft clipping. this effect is subtle on simple waveform sources and dramatic on more complex sources (like chords). the module is in good physical condition and works perfectly. for more info click here. the plog comprises two programmable logic sections (select one of six different 3 input boolean logic types) as well as a toggle flipflop and data flipflop block. all four sections are linked together via specially planned normals. module is in good working condition. for more info click here. a handy module for monitoring your system with headphones and connecting to line level amplifiers or recording devices. the headphone amp is low noise and capable of driving high impedance studio headphones. the module is in good physical condition and works perfectly. for more info click here. the router is a 8 step sequential switch for euro format systems. it features 8 bipolar input/outputs and one common bipolar input/output. there are clock, reset, direction and hold inputs used to drive the movement and direction of the sequence. there is also a gate output section for triggering the router�s functions as well as any other gate duties in your system. module is in working condition. for more info please click here. as its premier offering in the modular synthesizer world, the k4815 pattern generator by kilpatrick audio packs incredible power into a small 20hp eurorack module that offers virtually unlimited creative potential for modular players. the k4815 can produce notes and varying control voltages for a wide range of musical applications. its unique approach to music creation is sure to have you finding new melodies and rhythms never heard before. unlike a step sequencer, where the player picks each note in a sequence, the k4815 creates sequences by combining a scale, a visual pattern (as shown on the display) and a sequence playback motion to determine the rhythms and notes that are actually played. other parameters can adjust the note and sequence length, as well as the transposition, direction of playback, and so on. the module is in good physical condition and works perfectly. for more info please click here. the dual cyclotron is a special kind of interrelated lfos that bribe with their clear layout and nice knobs. the result is always astonishing and in combination with one or two oscillators you get complex material you won't get from an usual modulator. it's also very nice as a sound generator specialized in totally ill sounds. module is in good working condition. for more info please click here. brains is a clocked sequential binary event machine, intended to be connected to tactile controllers such as the pressure points. once connected, pressure points provides data input to brains in the form of touch selectable reset stage and hold stage. pressure points also provides the tuned voltages and patchable reset pulses per stage. brains, when connected to either 1 or 2 pressure points, will drive the stage selection in a sequential fashion, at a rate determined by the incoming clock at clock in, thus forming a 4-step or 8-step 3-channel analog sequencer. binary control over direction of the stage selection, run/ stop and reset are provide. the touch-gate out is the only output on brains, producing a gate high signal whenever a pressure points is touched. pressure points is a controller in which 1 of 4 sets of 3 tuned voltages are selected by touching the corresponding printed copper wire at the bottom of the instrument (aka the touchplate). touching pressure points, you become part of the circuit, generating a gate signal (gate out), a control signal proportional to the amount of pressure applied (press out) and activating the corresponding stage. the tuned voltages for the activated stage appear at their respective x, y and z outs. in this way, pressure points is like an analog sequencer that is played by hand. The modules are in good physical condition and works perfectly. for more info please click here and here. the echophon is a collaboration between dsp software pioneer tom erbe (soundhack) and modular synth nerd tony rolando (make noise). the module utilizes erbe's gorgeous algorithms on hardware developed by make noise. the echophon flips the script on the 20 year trend of software synthesis emulating classic analog hardware putting the powers of a true dsp coding genius into the analog modular. module is in good working condition. for more info please click here. the morphagene is a next generation tape and microsound music module that uses reels, splices, and genes to create new sounds from those that already exist. search between the notes to find the unfound sounds. some of the morphagene's most basic uses: splice recorded audio and jumble it using organize. manipulate playback speed and direction with vari-speed. granularize with gene-size and slide. layer or stagger genes using morph. undertake iterative music processes by recording manipulations and overdubs into new splices, like having two machines (one for playback and modulations, one for record). process sound in real time using time lag accumulation. utilize envelope following cv out and eosg trigger to engage morphagene in conversation with the rest of your modular system. stretch and squash sound with clock input. the module is in good physical condition and works perfectly. for more info please click here. the phonogene is a digital re-visioning and elaboration of the tape recorder as musical instrument (firmware engineered by flemming christensen, gotharman). it takes it's name from a little known, one of a kind instrument used by composer pierre schaeffer. while it is not an emulation, it does share the primitive, tactile nature of it's namesake, and expands upon the original concepts. it is informed by the worlds of musique concr�te (where speed and direction variation were combined with creative tape splicing to pioneer new sounds) and microsound (where computers allow for sound to be divided into pieces smaller then 1/10 of a second, and manipulated like sub-atomic particles). having voltage control over every parameter, it is most successful as a digital audio buffer for the modular synthesist. module is in good used condition & perfect working order. for more info please click here. "cartesian sequencer," "geometric sequencer," "planular sequencer," "axis sequencer," and finally, in buchla-speak, "non-linear sequential tuned voltage map." "rené," for the man rené descartes. the primary goal of this sequencer is to have a maximum amount of artist controlled musical variation, with a minimum amount of data input. there are no menus, all editing is done real-time, and thus, the programming of rené becomes a key performance element. module is in good used condition & perfect working order. for more info please click here. a compact voltage controlled oscillator designed for generating sine waves, variable wave-shapes, sub-octaves, oscillator sync and linear fm in the analog domain. the sub-timbral oscillator is the more subtle and melodic friend to the dpo's complex harmonic lattice. module is in good used condition & perfect working order. for more info please click here. the teleplexer is a telegraph style multiplexer (signal router) that applies the fast, physically immediate techniques of telegraphy to playing the modular synthesizer. the user patches any number of control sources leaving the destination end of patch cables un-connected. destinations are patched to the outputs of the teleplexer. touching the tip of any patch cable carrying a source signal to the surface of the teleplexer creates a momentary connection. the user determines the destination(s) and polarity of signal by touching the patch cable to any one of the 14 metal plates. module is in good used condition & perfect working order. for more info please click here. the anti-oscillator is an analog triangle-core oscillator with unique voltage-controllable waveshaping capabilities. module is in good working condition. for more info, please click here. the borg is different from most filters in that, at its heart, is a vactrol. vactrols are combination light sensor/light resistors that possess interesting sonic traits. often described as "rubbery" or smooth in quailty, vactrols are also know for their relatively slow response. this response creates a natural, very musical decay. in low pass gate (lpg) mode, the borg will act as a filter and a vca simultaneously. in combination with the characteristic vactrol response, this creates a signature sound that is desired by many synth enthusiasts, especially when used with very short, percussive patches. module is in good condition & perfect working order. for more info, please click here. the malekko/richter oscillator ii is a great-sounding, solid analog oscillator/lfo with some serious tricks up its sleeve. module is in good used condition & perfect working order. for more info please click here. passive transformer channels that shift signal level; bidirectional audio path; send and return your guitar pedals (may need gain); apply dc offset to saturate your audio; unbalanced, use ts ¼ plug. module is in working condition. for more info please click here. the triple osc provides 3 oscillators controlled by a common cv or 1/v per octave pitch control. mixer functions are handled internally, controlled by a single pot or cv. the range for the primary oscillator is 10 octaves with an offset range of +2 octaves for osc2 and osc3 adjustable in both quantized semitones and non-quantized values switch selected. the module is in good physical condition and works perfectly. for more info please click here. kriket is a 4 channel blip & beep percussiøn generatør with cv capability øver gløbal pitch. signals plugged intø the "bang!" inputs will cause the kriket tø øutput a square wave that is prøpørtional tø the incøming pulse - if the incøming trigger is "high" the nøte will stay øn, if the incøming trigger is "løw" the nøte will turn øff. this feature alløws the user tø dial in blips and beeps øf different lengths by varying the pulse width øf the trigger. the "kriket" input is cønnected tø a 4 channel vactrøl that cøntrøls all 4 øf the pitches simultaneøusly. this input can gø all the way up tø audiø rates and if you ping it with a trigger, it makes the kriket *chirp* "pew pew!" in a laser like manner. module is in good used condition & perfect working order. for more info please click here. muskrat is a flexible, 8-bit wavetable drum synth. there are 23 øn-bøard wavetables tø chøøse frøm, either manually ør via bipølar cv input. pitch and phase distørtiøn include bipølar cv inputs and accept -5v to +5v. the "trigger" input is designed withøut input cønditioning and picks up signals øf all varieties. in øther wørds it is an enveløpe følløwer circuit. yøu can plug an external cv ør øffset intø this input and it will øperate like a regular vca. før even møre extreme søund mangling, engage the muskrat møde via the switch tø feed a randøm number intø the phase accumulatør at the internal cløck rate. this møde alsø includes a gate input that acts as an "accent". module is in good used condition & perfect working order. for more info please click here. abstract eurorack format rhizomatic cascading counter for monome grids. meadowphysics facilitates the exploration of polyrhythms and rule-based sequencing, producing a wide range of emergent patterns. a monome grid is plugged into the front panel of the module, serving as a complete interface. the procedure continues running when the grid is disconnected, facilitating both live performance and precomposed playback of generative systems. module is in good used condition & perfect working order. for more info please click here. white whale is the culmination of methods and experiments based on a decade of step sequencer design for the grid. a monome grid is plugged into the front panel of the module, serving as a complete interface. the sequencer continues running when the grid is disconnected, facilitating both live performance and precomposed playback of generative systems. a sixteen step loop is the foundation. 4 triggers can be toggled per step, along with two separate cv values. 0-10v cv can be dialed via a parameter knob, copied from other steps, and tuned up and down via the grid. a cv map mode is provided for creating scales, and preset scales are recallable. module is in good working condition. for more info please click here. braids is a voltage-controlled monophonic digital sound source. sound source...like an oscillator? not really. most of the timbres it generates are so complex that approaching them with a classic analog modular setup would require a full case of oscillators, filters, vcas, waveshapers and ring-modulators - that's why we call it a macro-oscillator - intricate digital synthesis algorithms wrapped in oscillator's clothes. module is in good working condition. for more info please click here. elements combines an exciter synthesis section, generating raw, noisy sounds characteristic of bowing (filtered friction noise), blowing (pitch-controlled granular noise), or striking (stick, mallet, hammer or brush sample playback... or bursts of synthetic impulsions). these sources, or external audio signals, are processed by a modal filter bank - an ensemble of 64 tuned band-pass filters simulating the response of various resonant structures (plates, strings, tubes...) with adjustable brightness and dampening. a stereo ambience reverberator adds depth and presence to the sound. module is in good working condition. for more info please click here. the heart of frames is a 4-channel analog vca under tight digital control. through flexible input/output mixing and normalling options, it can be patched to serve the following purposes (among others): 4-channel attenuator/vca, 4-channel mixer, 4-channel programmable cv source and quadraphonic signal dispatcher. module is in good working condition. for more info please click here. links provides 3 utility functions focused on signal distribution and mixing. module is in good working condition. for more info please click here. marbles is a source of random gates and voltages, which offers an extensive amount of (voltage) control on all the different flavors of randomness it produces. module is in good working condition. for more info please click here. just like its predecessor, it offers direct access to a large palette of easily tweakable sounds, covering the whole gamut of synthesis techniques. what has changed is the interface: gone are the screen, menu system, hidden settings, and the long list of somewhat redundant synthesis models. the module is in good physical condition and works perfectly. for more info please click here. ripples delivers a classic, big-sounding four-pole filter in a small 8-hp package, continuing mutable instruments' lineage of warm and tasty filters started by the shruthi smr4 mkii and 4-pole mission. module is in good working condition. for more info please click here. evolved from the oscillator mixing section of mutable instruments' desktop hybrid synths, warps is designed to blend and combine two audio signals. a variety of wave-shaping and cross-modulation methods - some of them emulating classic analog circuits, some of them purely digital - are provided by the module. module is in good working condition. for more info please click here. 23 octave multi mode voltage controlled oscillator. module is in good condition & perfect working order. for more info please click here. the filter is a voltage controlled, analog, state variable filter. the state variable topology was chosen because it allowed us to produce a very smooth and natural sounding filter, in addition to offering several other modes of operation, each with a unique sound and energy all their own. module is in good used condition & perfect working order. for more info please click here. a dual oscillator built around two triangle core, wide range, periodic waveform generators. as a multipurpose signal generator, it can provide the basis of a wide range of complex sounds ideal for tuned percussion/noise, abrasive amplitude, frequency and timbral modulation. tones, drones, textures, and drums to atonal, nintendo zipper/fart noises. this module was made for fm madness. the genxpander is an expander module for the generator. it adds standard waveform outuputs, internal fm waveform selection, and extensive waveshaping capabilities to the generator module. these modules are in good used condition & perfect working order. please click here and here for more info. true analog innovation, the lifeforms primary oscillator was designed to stretch the boundaries of pure sonic sculpting. the primary oscillator uses unique cascading waveform processing to create increasingly complex, fully modulatable waveforms. through the use of multiple interwoven waveshapers, a simple waveform can quickly mutate into something deeply dynamic and harmonically rich. module is in good working condition. please click here for more info. the lifeforms sv-1 is a synthesizer powerhouse, providing absolutely everything you need to create gigantic and iconic synth sounds: roaring bass, shimmering leads, lush pads and warm drones are only a few knob turns away. instantly, out of the box, a rich feature set with a fluid, easy to understand interface empowers you to create vibrant, thick tones. modulation and tools sections fill out the analog sv-1 modulation capabilities with a triangle and square lfo, two sub-octave oscillators chained to the main oscillator, and noise with sample & hold. the module is in good physical condition and works perfectly. please click here for more info. the pittsburgh modular synthesizers lifeforms sv-1 blackbox is a complete, standalone desktop format modular synthesizer. a full compliment of analog tools for sonic experimentation stuffed into a portable, powered steel enclosure. two patchable oscillators and our legendary state-variable filter are paired with a perfectly curated set of synthesis components including a dual sub oscillator, dual, chained mixers, a plucky, four stage envelope generator, sample and hold, noise, low frequency oscillator, voltage controlled amplifier, a feature rich midi to cv converter, and a pair of utility signal splitters. module is in good working condition. please click here for more info. the pittsburgh modular lopass gate module is a new take on a classic. our intention was not to clone but to reengineer and expand on the original circuit. our module includes an amazing new self-oscillating resonance circuit and a quieter vactrol based vca circuit with true unity gain. voltage control of the module is handled using an invertible, attenuated input and ping input. the ping input takes any gate or square wave and converts it into a very tight trigger used to ping the vactrol. module is in good working condition. please click here for more info. the pittsburgh modular phase shifter is a complex, 16 stage, analog effect module designed to expand on the classic swirls, rich swooshes, and doppler effects associated with the phaser. module is in good used condition & perfect working order. please click here for more info. the pittsburgh modular system 10.1 + plus is everything you love about the system 10.1 but with room to grow! the pittsburgh analog replicator makes an excellent companion to this system! the pittsburgh modular system 10.1+ is a full featured single voice, analog synthesizer and a great starting point into modular synthesis. using the synthesizer block module as it's centerpiece, the system 10.1 contains all of the most important components of a modular synthesizer. connected internally, the cell system 10.1 is hardwired to create a complete monophonic synthesizer without needing to add patch cables. however, each major component within the system 10.1 is fully patchable and can function independent to the rest of the system by using the available patch points and included patch cables. system is in good used condition & perfect working order. please click here for more info. the pittsburgh modular timetable module is a clock divider / pattern & cv generator. the primary intention of timetable is to provide timed gates, both predictable and inconsistent. in practice, you can use the module as a straightforward clock divider and pattern generator or as a hyperactive gate and cv spewing lunatic...and of course something, somewhere in the middle. a binary system that sometimes gets stuck somewhere between 1 and 0. module is in good used condition & perfect working order. please click here for more info. the vc bend is designed as a way to create less than certain variations from pre-determined control voltages, like transposing / inverting a bassline into a melody or creating a 3rd envelope from 2 sources. used at audio rate, it acts like a voltage controlled full wave rectifier. the vc bend favours 'esoteric' applications over precision. more often than not the output voltage will not resemble the input. functionally, the vc bend sits somewhere between a sample and hold and a quantizer module. however, the type of modulation produced is completely unique to the vc bend. module is in good used condition & perfect working order. please click here for more info. the pittsburgh modular voltage influenced lfo is unique in the modular world. it is a strange, triangle based lfo that lives in an 8hp euro panel. the module offers two outputs, a triangle wave, and a variable waveform that shifts from a triangle to something that is almost not completely a square wave. the vilfo also includes a unique voltage influence circuit. the influence works differently than standard control voltage inputs, it allows the incoming cv to mingle with the lfo waveforms in interesting ways, creating unique modulations and patterns. module is in good condition & perfect working order. for more info, please click here. a wide range, high quality, complex vco designed to be the core of a modern, analog synthesizer. the waveforms module offers a full complement of standard waveforms including sine, triangle, saw, and pulse waves in addition to a sub octave generator and a unique modulatable blade wave. the oscillator offers 5 octaves of 1 volt per octave tracking, and a frequency range starting as low as 7 seconds per cycle, allowing it to double as an lfo. additional features include oscillator reset for hard syncing, attenuated linear or exponential fm input, pulse width, and pulse width cv input. module is in good used condition & perfect working order. for more info please click here. dedicated start/stop led switch (it's a hard reset to start of the pulse). dedicated sync/async led switch. speed control pot (aka frequency). space control pot (changes the outputs from triggers to gates). cv in for speed. cv in for space. cv/pulse in for start/stop & reset. 16th note output of speed. 8th note output of speed. 4th note output of speed. 2nd note output of speed. size: 6hp. power consumption: +38ma / -22ma. speed cv input: &pm;5v. space cv input: &pm;5v. outputs: 0-10v. module is in good used condition & perfect working order. for more info please click here. the att-off packs a lot utilty into a single tile. it uses a dual-concentric pot to give you access to a pair of useful functions: dc offset and attenuation. additionally, the tile is normalled so that it will act as a dc voltage output when nothing is plugged into the input. module is in good working condition. for more info please click here. the fsr tile uses a interlink electronics (30-81794) force sensitive resistor to generate a cv and gate output. module is in good working condition. for more info please click here. this tile is a simple lfsr based random pulse generator that outputs 10 vpp (+/-5v) gate signals. when using a high clock rate, this can be used as an audio noise source. the rate input is normalled to +5v, so when no cable is inserted, the pot works as a rate controller for the noise generator's clock. when a voltage is run into the rate jack, the pot works as an attenuator for the rate signal. module is in good working condition. for more info please click here. nebulæ is an audio file player/granular oscillator in the eurorack modular synthesizer format. it uses sound files as the source material for creating loops, melodies, granular clouds, drones, pads and otherworldy textures. ships with a flash drive containing a copyright free sample library recorded and mastered specifically for nebulæ. module is in good used condition & perfect working order. set yourself free from the tyranny of quantized rhythms. no more cold, lifeless patterns. enter the world of push and pull that has been present in music since time immemorial. tri-ger is a 3 channel pattern recorder. it is capable of recording and looping patterns up to 52 seconds in length, while providing a subdividable master clock output to keep the rest of the patch in time with the rhythms the user plays. punch in record, play/pause, mute, and roll functions make the tri-ger the best way to clock any patch in a musical fashion. module is in good working condition. for more info please click here. the wave is a voltage controlled, polyphonic sample player. it is designed for the simultaneous playback of high fidelity audio files. module is in good used condition & perfect working order. for more info please click here. warm and vintage sounding low resonance settings as well as aggressive and modern high resonance sounds - the rt-451 does both. it is very flexible and has a lot of character. module is in good working condition. for more info please click here. klasmata is a single channel, voltage controlled version of stoicheia. it offers a range of 1-32 steps, opening up more possibilities for complex patterns. with voltage controlled sequence length and fills, klasmata can transpose, shift and modulate rhythmic patterns at up to audio speeds. just like stoicheia there is a normal and a toggling operating mode. the three-way switch is also used to stop and reset the sequence. the voltage controlled parameters have individual level settings. the controls are otherwise identical to stoicheia. module is in good condition & perfect working order. for more info please click here. stoicheia is a dual euclidean sequencer. it algorithmically generates rhythmic sequences from an input trigger signal. the name comes from the title of euclid's book elements in which the algorithm was first described. module is in good working condition. for more info please click here. the 512 dual vco (voltage controlled oscillator) is a single module consisting of two voltage controlled oscillators. each independent vco produces frequencies across a wide range with 1v/octave tracking and dedicated pulse, triangle, and saw wave outputs. variable pulse width is available via panel control or cv modulation. each oscillator's frequency can also be synchronized to the other in weak or strong modes to achieve a unique "sync" sound. module is in good physical condition & works perfectly. for more info please click here. based on the classic system-100m modular synthesizer, the system-500 is a fully analog recreation of one of the most revered electronic instruments of all time. newly designed in eurorack format, the system-500 delivers the classic character and functionality of the original with the advantages of a modern instrument. built in the usa and assembled in japan, the system-500 is made to exacting standards with top-quality components and solid controls. and it's surprisingly affordable, turning the fantasy of finally owning this legendary instrument into reality. module is in good used condition & perfect working order. for more info please click here. the chaos brother is a new modulation module full of enough options and knobs to keep it interesting no matter where you decide to use it. it all starts with the chaos knob, when turned all the way to the left, you get repetitive, tame oscillations like you would find in a basic lfo. start turning the knob to the right and the chaos ensues. the speed of the chaos can be adjusted with the speed knob so there is a wide range of variation possible. module is in good used condition & perfect working order. for more info please click here. the dreamboat is a dual chaotic oscillator with 2x cv inputs, a gate output with adjustable threshold, and two sets of x and y outputs. there are two oscillator sections to the module, the top half is an audio rate chaotic oscillator and the lower half outputs lfo rate signals. with its five outputs, the dreamboat allows you to connect to plenty of modules all at once, allowing all kinds of modulation and listening possibilities. when used with an oscilloscope or a scope program in x/y mode, the dreamboat allows you to view its chaotic attractors in realtime. module is in good working condition. for more info please click here. the tidal wave is in first line a sound processor with waveshaper, filter and vca but on the other hand a synth voice. a flexible vc-mix/crossfader section with is used to create comb filter effects. a vc-lfo and an autotrigger envelope plus an internal modulation buss are used for cv routing with interesting opposite going modulations. all sections of the module can be used individually. module is in good used condition & perfect working order. for more info please click here. 8 tracks, global and individual length, store and recall your patterns, song modes, shuffle, master and slave clock, x-y step activation and, first in the market: 4 cv input to change parameters and behaviours on the fly and much more! if you need a step sequencer for your drum modules, triggering needs and many other things, this is the most potent sequencer out there. module is in good used condition & perfect working order. for more info please click here. the four-tap delay / dual crossfader provides a wide range of delay options from extreme taps (note the x10 switch) to warbling tape feedback. module is in good working condition. for more info please click here. steady state fate is pleased to announce gnd ctrl (ground control), a novel, compact utility for your modular system. gnd ctrl was designed with the intention of unifying utility functions, while providing some advanced features never before seen in the modular realm. this all-in one utility is the perfect solution to bridging the ever expanding cv and audio standards of our diverse modular format. that includes video standards too! additionally, you never have to guess what your cv and audio levels are again because gnd ctrl gives you instant feedback while processing your signals. want to measure levels without affecting the signal? no problem! gnd ctrl also provides a way to measure voltages non-destructively via a dedicated meter aux input. module is in good used condition & perfect working order. for more info please click here. the expander provides panel mounted controls for the bipolar symmetry and threshold adjustment of the saturator as well as cv inputs for voltage controlled saturation. module is in good used condition & perfect working order. for more info, please click here. the first module of the ultra-random series, the ultra-random analog is a random voltage generator with six random outputs including two clocked stepped random outputs - one with built in logarithmic slew, a third stepped output that toggles between two internal noise sources or whatever is patched into the sample inputs, a fully voltage controllable smooth fluctuating random voltage output, a voltage controllable random gate/noise with 7 selectable levels of randomness and an independent vactrol based voltage controllable integrator - all with a built in 1v/oct tracking voltage controlled clock. the ura can additionally function as a dual sample and hold, capable of wave shaping and sample reducing cv and audio. module is in good working condition. for more info, please click here. the time buffer is a clock conditioner and distribution amplifier for injecting and distributing sync24 (also known as "din sync") into and throughout a modular synthesiser for any stg soundlabs clock bus compliant modules such as the graphic sequencer and the trigger sequencer. there are connections on the circuit board of this module to send clock to up to 7 devices, or eight if the front panel output is disconnected. module is in good used condition & perfect working order. for more info please click here. aa.1 is designed to be your bridge between the world of guitar pedals and the world of eurorack modular. this compact 4hp amplifier attenuator module has everything you need to interface your modular with your guitar effects pedals as well as with your guitar or bass. module is in good working condition. for more info please click here. the 3003 filter is a voltage controlled, discrete analog 18 db/oct ladder low-pass filter, employing hand-matched transistors. drop the frequency knob to 0 and things get pretty dull; swing it back up and those "transistor bass" highs come crashing through the gate. the 3003's resonance circuit at max will sing out more than the tb's signature chirping in a fun, bubbly, if washy, poorer relation, mini "clone-ish" way; use it tastefully, or throw moderation to the wind for overwhelming chirp force. module is in good working condition. for more info please click here. the amplifier (amp) is a 2 stage class a discrete design using 3 pairs of hand matched transistors. envelope is usually applied to st1/1. st1/2 goes thru an attenuverter and can be used for envelope or modulation. st2/1 goes to the 2nd stage, and is typically used for volume control. st2/2 goes thru an attenuverter and is typically used for modulation. module is in good used condition & perfect working order. for more info please click here. what's nice about our oscillation stunner (according to tim) "is that the waveforms are dc-coupled [components connected directly together without any coupling capacitors], so they keep their shape even at sub-hz speeds. the outputs are also buffered, so the amplitude is independent of the load they are driving. the waveform levels on some modern eurorack oscs are often all different, and they vary depending if they go into the mixer or directly to the filter!" coupling the circuitry without capacitors in-line gives the go-ahead for the full spectrum of frequencies to do their thing, and ensures near identical response over the years�audiophile, transistor-protecting signal path stuff here. you should see these beauts on the scope: a class-a ballet of balance and proportion, only drawing modest current, evenly from plus and minus. module is in good condition & perfect working order. for more info please click here. if you've heard the sem filter in our boomstar desktop you also know that this 12 db favorite is "capable of lighter, more subtle tones than the other three models. this isn't to suggest the filter's low pass mode can't cater for fat and punchy, because it can." - paul nagle, sound on sound. looking for deeply gratifying tonal variance and this emotional warmth? try this - our friend fred falke's favorite - it can reach into your head and heart, and stay as long as desired. thank you lord tom oberheim for this marvelous design/template from which we were able to work our very own studio electronics eurorack filter enchantments. module is in good condition & perfect working order. for more info please click here. the slim o shares our beefy oscillation sound engine, so it is every bit as gorgeously stable�and of course tracks pitch remarkably well�but is sensibly slimmed down to 8hp essentials, with no tonal or quality sacrifice allowed; the slimo is midimini big sonically, with a three position octave switch for smart and easy octaving. module is in good working condition. for more info please click here. tonestar folktek is an arias blaze / folktek fibonacci flight, feast and fancy. we were hyped when arias told us, "i like your layout - it's very approachable. and you've got some hex things happening which i'm all about" who knew the tonestar was so hexy? module is in good working condition. for more info please click here. not yet another lfo/vco pair, the model 52 vampire is a dense timbral pitch source that will re-animate even the most cadaverous patch. similar to a complex oscillator, vco1 is pre-routed through panel switching and jack 'normalling' to synchronize and frequency modulate vco2's linear or exponential inputs. like a dual oscillator, two full range oscillators provide a fat audio output with six possible waveforms each individually and externally available for synchronization and external modulation. then things start to get out of hand. module is in good working condition. for more info please click here. converts midi clock to 24 ppqn clock and start/stop. module is in good working condition. for more info please click here. the synthesis technology e340 contains eight sine and sawtooth vcos with unique modulation capabilities. the term "cloud oscillator" was first used by ambient musician robert rich when he was recording his bestiary album. robert wanted to create a "buzzing, swarming cloud of sine waves," and after some experimentation, he was able to create such a timbre using 24 individual motm modules. now the technology is available to generate this type of sound in a 14hp wide eurorack module. module is in good working condition. for more info please click here. the e355 has features to make it useful in both live and studio use. the 2 lfos are "locked" to each other in one of 3 ways, selectable by a panel switch. lfo2 and lfo1 have independent rates and the same waveshape and phase. lfo2 has independent waveshape but the same rate and phase as lfo1. lfo1 and lfo2 have the same rate and waveshape but variable phase from 0 -360 degrees. the module is in good physical condition and works perfectly. for more info please click here. the synthesis technology e580 resampling mini-delay emulates the classic sounds of digital, bbd and tape-based delays with 4 parameters under voltage control. the 14hp wide euro module accepts either �12v euro standard power or &pm;15v motm/frac power. using a 40mhz dsp and 24-bit codec, the e580 recreates the pitch-shift modulating of bbds with the variable bandwidth and noise floor without costly bbd ics. in tape mode, wow& flutter, tape saturation and non-linear distortion model classic tape units without the bulk and maintenance. there are 2 simultaneous audio outputs: a straight delay and a variable tapped delay. the tap position is a percentage of the main delay time. this allows very short delays (<350us) as well as long delays (750ms). both tap position ('offset') and main delay time are voltage-controlled over a -5v to +5v range. module is in good used condition & perfect working order. for more info please click here. chaos comes in many sizes, luckily the chaos nand tri-oscillation drone module fits into your hands. you control the x, y and z axis of the phonetic time grid. perform nuanced sublimities and blaring anomalies by the turn of the fingers or through control voltage input. new audible heights can be discovered by powering the module by control voltage via the sag input. all three oscillations are powered by today's most popular genuine vactrols. module is in good used condition & perfect working order. for more info please click here. the 'sequence 8' analog 8-step sequencer is a traditional 8-step sequencer with some extremely handy features. module is in good used condition & perfect working order. for more info please click here. the fsr-4 module is one of our growing series of modules based on force sensing resistor (fsr) technology. these modules translate the pressure the performer applies to the sensing pads to user adjustable scaleable control voltage and adjustable threshold dependent gate signal. module is in good used condition & perfect working order. for more info please click here. stillson hammer mark ii is a 4-track control voltage sequencer for realtime music performance. four cv/gate tracks directly control your collection of oscillators and percussion. seven pages of parameters determine your musical performance, edited in realtime with a bank of 16 sliders. a series of hotkeys immediately generate or modify sequences or individualised parameters across all four tracks, with no menu diving whatsoever. two cv inputs and large manual controls mutate any number of sequence parameters, with programmable modulation amount per step. 32 preset slots are provided for your storage of sequencer data. the keypad, rotary encoder, cv modifiers, led feedback (on all buttons, sliders, and numerical display) and slider bank work in harmony to allow astonishingly fast music creation across all four tracks, in an ergonomically valid user interface uncommon in modular synthesis. it is possible to quickly generate and meaningfully manipulate a full 4-track sequence with minimal slider interaction. module is in good working condition. for more info, please click here. sawtooth-core vco with 1v/octave tracking, manual octave switch, voltage-controllable pulse width modulation, and both linear and exponential frequency modulation. this is a eurorack packaging of the polivoks generator circuit, authorized by the instrument inventor vladimir kuzmin. the exponential converter and temperature compensation circuits use original nos soviet integrated circuits. the hard sync is very sharp and the distortion on the triangle output is nice. module is in good used condition & perfect working order. malgorithm mark ii is the long-awaited redesign of the world's first voltage-controlled bitcrusher, now available in high-resolution stereo with expanded controls. the module is in good physical condition and works perfectly. for more info please click here. the double andore features a symmetrical control layout with two identical sides. the top section of each half is an a-d envelope generator. a trigger input is provided, along with "freeze" and "mirror" gate inputs. the former holds the envelope at its current position, and the latter inverts the position of the envelope within its voltage range. the envelope signal passes through a digital curve shaper whose selected curve is numerically displayed. normally, each half of the module has its shape selection apply to both the attack and delay phases of its envelope, but you can enable an alternate mode where the left and right shape select controls instead select different curves for attack and decay. two banks of envelopes are available. module is in good working condition. for more info please click here. dual digital oscillator with internal modulation bus. voltage-controlled waveform discontinuity, internal pitch tracking with several lag settings. dedicated square wave outputs, and a multi-purpose gate/xor ringmod output. module is in good condition & perfect working order. for more info please click here. hertz donut features two independently functioning digital oscillators with wide frequency ranges. an internal bus enables full-bandwidth, high-index modulation of oscillator frequency, wavefolder drive, tracking phase, and amplitude, with the modulation signal appropriately conditioned for each destination. nearly all voltage control nodes feature "attenuverters" for bipolar modulation of the main parameters by an external voltage. internal and external frequency module is thru-zero. module is in good condition & perfect working order. for more info please click here. the name might be misleading because, yes in some knob positions you will get the classic 909 kick, but there is way more in there, it's really a little bass drum lab with a lot of sweet spots. it can go low, high/smooth/harsh, and anywhere in between; it can also go weird with the vc inputs. if you are used to the bd808 then this will take a bit to get used to because it is a different beast, although with some adjustment you might get close sounds. the pcb is very dense with a lot of circuitry and it wasn't easy to fit all that in there but it sure was worth the challenge. the module is in good physical condition and works perfectly. for more info please click here. circadian rhythms moves modular synthesizer technology another step forward by gluing all the pieces of a system together. each module or voice can now be programmed to play straight from an intelligent eight channel, 512 step master trigger sequencer made for composers looking to make music on the modular. building on the sequencing concept of step programing, multichannel patterns of musical phrases can be repeated, looped, chained, muted and manipulated on the fly in real time; and most importantly, all of this is done through a simple, clearly labeled interface. an array of multicolor illuminated buttons and innovative grid views provide a highly functional live performance sequencer with a beautiful glowing appearance reflecting the programmed music that will look amazing on stage for both performer and crowd. as a master controller, the heart of the modular synthesizer, circadian rhythms generates high precision clock and reset signals for all the other sequencers and devices in the system to align with and can also act as a high precision bridge for daw synchronization. module is in good working condition. for more info please click here. the hats909 is the tr-909's original closed and open hi-hats circuits adapted for use in eurorack modular synthesizer format and was tested to sound like a fresh machine coming out of the assembly line back in the 80's. on top of the original, we have added some great new features that expand the sound palette of hats that can be produce with this small yet powerful module. the module is in good physical condition and works perfectly. for more info please click here. with the z8000, you can simultaneously modulate many parameters in your synthesizer polyrhythmicly, with unprecedented motion. one knob affects all 10 cv outputs! imagine modifying 10 parameters from one knob, and all clock inputs can be driven at audio rates. module is in good condition & perfect working order. for more info please click here. he toppobrillo multifilter is a new/ traditional state-variable design based on a great modern quad vca chip, the ssm2164. this, in part, helps make the multiflter what it is, a clean, quiet, stable and very controllable filter at it's core, without limiting its palette, well suited for processing anything you can run through it. much attention was paid to the range and feel of the controls, inputs and overall usability, including all options standard and more; a very versatile processing tool with amazing sound in a small package. module is in good working condition. for more info please click here. "quantimator" is a new multifunctional quantizer concept that expands on past implementations to offer up something new and totally unique in the modular world- essentially combining a "scale quantizer" and a "chord generator" that takes full advantage of having multiple outputs and a brain. designed to be equally useful in monophonic or polyphonic composition, the quantimator has the unique ability to digitally rotate note data [cv] at it's outputs, "analog shift register" style- thus making arpeggio of chords and "arabesque" musical patterns easy and accurate, as it does not suffer the limitations of analog. in addition, the hold input can be used to "freeze" the outputs indefinitely in either mode. module is in good working condition. for more info please click here. the twf module was designed with multi-use in mind... it is composed of three identical (with the exception of a couple features) direct-coupled waveshaping stages that can be used independently or in series, the operation is selected according to which inputs are used. module is in good working condition. for more info please click here. the pdo exists to utilize the phenomenon of phase modulation (pm). this allows for the relative phase difference of its outputs to be set or modulated, producing very interesting sounds. the result is similar to frequency modulation (fm) but affects the output to a greater degree without affecting the stability of the initial frequency. the module is in good physical condition and works perfectly. for more info please click here. the amplitude & tone controller is a totally discrete vca with simultaneous exponential and linear cv input. it has a discrete output stage, too. but it also is an all discrete vactrol based voltage controlled lowpass filter with diode limited resonance. it also has a discrete gain stage on the input. careful balancing of the input gain and resonance control sets a mix of self oscillation and input signal, distorted on the vca input as you wish. no ics anywhere in the signal path. the module is in good physical condition and works perfectly. for more info please click here. this di-box in a module offers two adjustable, electronically balanced xlr-outputs for stereo or independent dual-mono use. an additional headphone output, also suited for line level output completes twinout's feature-set. to bring out the best of your modular synthesizer, there's no getting around the twinout! module is in good condition & perfect working order. for more info please click here. a bipolar vca is like a normal vca when operated with positive control voltage. but when using a negative control voltage, the output will swing back through zero amplitude and the output will be inverted. this produces deeper modulation than a normal vca. module is in good condition & perfect working order. for more info please click here. trshmstr is a collaborative effort between wmd and electro-dance heavyweights mstrkrft. trshmstr features an aggressive combination of band-pass filtering (fltr) and distortion (drv). the fltr and drv sections can be used independently or together to produce a wide variety of tone-shaping, from subtle distress to full-on acid destruction. the ins and outs of the fltr and drv sections are cross-normalled, so you can run your signal through fltr and into drv or vice-versa with no extra patching. the module is in good physical condition and works perfectly. for more info please click here. spectrum is a precision, saw-core vco with eight possible waveforms (six simultaneous outputs), an eight octave switch, lfo mode and fm mode select with attenuation. in addition to the standard waveforms; sine, pulse, triangle and saw, spectrum features two selectable saw/pulse hybrid waveforms and two selectable sub-octave waveforms with variable range. the module is in good physical condition and works perfectly. for more info please click here. tool-box is a collection of six useful synthesizer utilities. this module includes a two input voltage summing section, a signal rectifier, bipolar comparator, analog or (maximum), an inverter and a voltage controlled toggle switch. tool-box provides the tools required for spicing up your patches as well as some of the typically overlooked utilities missing from most modular systems. the module is in good physical condition and works perfectly. for more info please click here. mini slew is a feature packed function generator and voltage controlled slew limiter. transient functions are generated using the rise, fall and shape controls. complex functions can be generated using the voltage controlled shape and vari-out via direct cv inputs. module is in good working condition. for more info please click here. bytom is a simple yet extremely useful utility module that helps you to work with control voltages in your system, combining various trigger/gate signal sources in order to obtain interesting rhythmic events useful for sequencing, modulation and patch "automation" purposes. module is in good working condition. for more info please click here. samara is a "swiss army knife" type of module, intended to serve the most common voltage and audio signal processing purposes such as attenuation, offsetting, mixing, inverting, and even basic waveshaping. samara features four channels-each with two inputs and an attenuator, additional switchable offset generators, four voltage level and polarity indicators, two adders with switchable scale, and a precision four-channel processor that selects minimum and maximum voltage. module is in good working condition. for more info please click here. the zlob modular t.h. svf filter does self oscillate at full resonance with no external audio input. there are two resonance settings selectable by a jumper on the pcb: max resonance produces a trapezoid wave while min resonance(jumper in left/up position) produces an almost sine like waveform. with the newest revision, max resonance is in the up position and trimmed resonance is in the bottom position. the module is in good physical condition and works perfectly. for more info please click here. you've been waiting all your life for the zvex fuzz factory eurorack module. over the years we've fielded many many requests from the synth community for a fuzz factory that would behave the same way for them as the fuzz factory does for guitarists. the self oscillation, the gating, the gooey sticky velcro tearing fuzz, all of that strange wonderful interactive excitement has arrived in this incredibly controllable box of mayhem. we wish the original was this fun...time for a re-design! the module is in good physical condition and works perfectly. for more info please click here.